You have to say that Fiat is versatile. At one end of the spectrum, you’ve got the small but feisty Arbath 500s. At the other end, you’ve got the slower but much larger Fiat Ducato Series 6. It’s a case of horses for courses. In this case, it’s a very specific horse for a very specific course. Other motorhomes and campers are built out of vehicles that can be used for multiple purposes. Not so with the Fiat Professional Ducato Series 6. The extra-long wheelbase variant has been developed from the beginning to be a motorhome as well as for other purposes that involve carrying a very, very large load, so the chassis and handling are set up just perfectly, without any of the wallowing or the problems that you get with other vehicles that have been converted to motorhomes from something else. Of course, the Fiat Professional Ducato Series 6 models comes in a variety of sizes, so you can find the commercial van that you want for whatever you need to do with it. The smallest Ducato Series 6 is a low-roof short wheelbase van, and the largest is the extra-long wheelbase with a mid-height roof that’s ideal for transforming into a motorhome. You also have a mid-roof medium wheelbase, a low-roof medium wheelbase and the mid-roof long wheelbase. Which one will be best for you will really depend on how much space and payload you need to carry. The short wheelbase has a cargo capacity of 8 m3 and takes a payload of 1605 kg. At the other end of the spectrum, the XLWB van has 15 m3, which is more room than in my garden shed, and a 2026-kg payload. The others have cargo space of 10, 11.5 and 13 m3 for the low-roof medium wheelbase, the mid-roof medium wheelbase and the mid-roof long wheelbase respectively, with the payloads being 1525, 1950 and 2145 kg. Just how high are the low roof and the mid-roof? 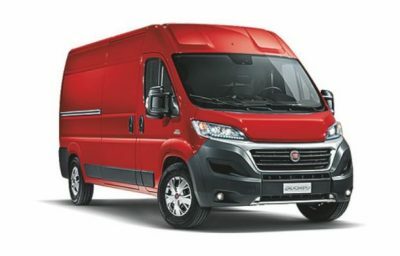 Even the low roof version of the Fiat Professional Ducato Series 6 van stands at over 2200 mm tall and with a loading bay height of 1662 m. In the mid-roof versions, the kerbside height is 2522 mm and the loading bay height is 1930 mm, which means that a guy six feet tall can stand up inside it without bashing his head – something that needs to be remembered if you want to set this up as a campervan! Our tall friend will be able to stretch out flat inside even inside the cargo bay of the short wheelbase version of the Series 6 Fiat Professional Ducato, as it’s 2670 mm long. The XLWB is about 4 metres long (4070 mm to be precise), which makes for a very roomy camper indeed. The rear doors on all models open to 270°, so you can even get those awkward loads in and out easily – yes, that includes wheelchairs and stretchers if you want to convert a Fiat Professional Ducato Series 6 van to an ambulance. To take a large load of that sort, you need a doughty powerplant, and the Fiat Professional Ducato Series 6 has got just that in the form of a 2.3-L turbodiesel that delivers 130 kW of power and 400 Nm of torque. The nose and the general design has been built for improved fuel efficiency, which means you won’t have to fill the fuel tank (you can get an extra-large fuel tank as an option as well). Six-speed “comfortmatic” automatic transmission comes as standard on the Fiat Professional Ducato XLWB and is an option on all the other models, which usually have six-speed manual transmission. Stability and body roll can be something of an issue with a lot of motor homes, so it’s pleasing to see that the designers of the Fiat Professional Ducato Series 6 have given this careful consideration. This van hasn’t been given your run of the mill electronic stability package that you’d find on a sedan car, but one that’s been adapted to cater to the needs of load-carrying vehicles and includes load-adaptive control and roll-over mitigation as well as the usual features such as ABS braking, hill holding and EBD. Traction Plus with hill hold descent to customise the driving style to the road surface (or the gravel or the grass or…) comes as an option. The suspension is vital for keeping what’s inside your Fiat Professional Ducato Series 6 level, whether it’s a load of carpet or the kitchen sink (literally!) or even (or particularly) a port-a-loo. The front is set up with independent McPherson type suspension with wishbones, coil Springs, telescopic shock absorbers and an anti-roll bar, while the all-important rear has a rigid tubular axle setup with and longitudinal parabolic leaf springs, telescopic shocks and flexible side buffers. As they wanted to maximise space inside the cargo bay of the Fiat Professional Ducato Series 6, there’s only seating for two. The driver and his/her passenger are kept comfortable on the durable cloth-trimmed seats. There’s also a seat for your phone in the form of a cradle for mobile phones or iPads, plus a two USB ports and a 12-V DC charge point. To ensure that your smartphone stays in that cradle, the Fiat Professional Ducato Series 6 comes with hands-free integration and voice control, and you get to see what’s going on thanks to the 5-inch touch screen. Satellite navigation and reversing cameras come as options, but rear parking sensors and cruise control are standard on all models. The Fiat Professional Ducato Series 6 van comes with a selection of nine colours ranging from basic white to more vivid shades, including bright red, navy blue and pale blue. There’s something for everyone. Of course, if you have an eye to customising your Fiat Professional Ducato Series 6 as a motorhome, you can use that ordinary white as a canvas and decorate it however you like. For any more information on the Fiat Professional Ducato Series 6, or for that matter any other new car, contact one of our friendly consultants on 1300 303 181. If you’d like some fleet discount pricing (yes even for private buyers! ), we can submit vehicle quotes requests out to our national network of Fiat dealers and come back with pricing within 24 hours. Private Fleet – car buying made easy!